This article was contributed by YPG member Annie Stone. If you are a YPG member and would like to contribute articles on publishing-related topics for our site, please contact Tara Powers at tpowers@wwnorton.com. The process for creating apps of our favorite picture books is unique; however, there are some starting points from which we work every time. Each one of our paid picture book apps, from a read-aloud book with activities to a complex, multi-game app, is a huge undertaking. Before we begin the app process we must determine whether the app concept is strong enough to stand out in the app store. If a particular concept is not an innovative take on the picture book app—or an innovative use of the device’s capabilities—it may be better as an enhanced e-book. 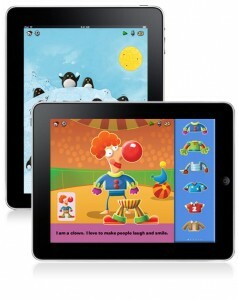 Many picture book properties have had successful lives in the e-book stores of the various devices on the market today. Development costs for an app almost double when you produce both iOS and Android versions, and Facebook apps are another beast entirely (the app design itself might not translate easily from a phone or tablet to Facebook, since the platform is so different). Consequently, it’s important to know your target demographic and your goals for the app when deciding which platform would be best. This can be a difficult decision to make, but the following are among our considerations: Facebook is technically not for young children, and COPA laws restrict reaching out to children online. Apple products are more commonly owned, and therefore might give you a bigger audience, although book-dedicated devices like Nook Color might better help you reach your intended audience of readers. Android tends to be popular with “techie” consumers and so might be best if for some reason this is your target demographic. And so on! Once your team has made some preliminary decisions about the app concept and market, it’s time for the developer to step in. Some companies work both with in-house talent and outside companies, depending on the app. For certain properties, multiple development companies might be interested in producing the app—high-profile properties often get a lot of interest. This is especially true because in app stores, book properties can get lost since they aren’t as “flashy” as some other brands. And because promotional space is limited, developers depend on the strength of the brand to be enough for consumers to actively name that brand in the search box. Of course, once an app is on the bestseller list, that will in turn propel sales forward—even more so than the New York Times list, app store bestsellers stay bestsellers in an endless self-fulfilling loop of discoverability. Assuming your team is using an outside developer for the app, you’ll receive proposals from various development companies who are eager to take on the project. Some companies specialize in children’s apps; a few have already made names for themselves as producers of picture book apps—Oceanhouse Media, for example, is the developer for the Dr. Seuss apps, which (unsurprisingly) have done extraordinarily well. Loud Crow is another good example—among other things, they produce the Sandra Boynton apps. Other companies do a mix of apps for various clients, producing apps for publishers but also working for very different companies such as Verizon or UPS. A major consideration when working on a picture book project is the art component of the app. While some artists work digitally and can provide layered files to the development team for them to manipulate (and even animate! ), many illustrators of course work in physical media. In order to adjust their artwork for app use, new artwork must often be created: for example, if a particular scene is going to be animated, each character’s pose must be illustrated, which of course is not work that already exists for the print book. Given budget concerns and illustrators’ time constraints, this can make getting the needed assets difficult. This is where the editorial and design teams come in—finding creative solutions to limited asset availability can be exciting and also incredibly tricky. Some programs have a wealth of scanned assets that designers can work with to create new files from already existing art, while others require more creative thinking. Once the design stage is completed, the development team begins work on the app—and the magic begins to happen. Developers send partially completed versions of the app for the author, illustrator, and publishing team to critique, and through an in-depth collaborative process, the app comes together—at first slowly, and then in leaps and bounds. As nearly finished versions come in, the editorial team will work with marketing and publicity, hoping to garner rave reviews for the app and perhaps producing app demo videos, flyers and handouts for an author tour if one is planned, online advertisements, and any other marketing assets. Soon the day of release arrives; for a picture book team, the speed of this process can be shocking. One day you’re giving last-minute tweaks, and as little as a week or two later, the app is available for purchase! Be forewarned that given the fast-moving nature of the app store, release day may be accompanied with nearly obsessive refreshing of the app bestseller lists. What’s next? Why, getting all of your friends and family to download the app, of course! With hour-by-hour updates, the app store charts are remarkably influenced by relatively small jumps in sales. And once the app is out in the world, there’s no telling whose hands it will fall into. While I may be biased (admittedly, the app is from my house), I have it on good authority that several non-English-speaking little girls in the Philippines have added the word “posh” to their vocabulary after using Fancy Nancy Dress Up. Ooh la la! Annie Stone is an assistant editor at HarperCollins Children’s in the Early Childhood Group, where she’s worked on the apps for Fancy Nancy, Pete the Cat, and Splat the Cat. You can follow her on Twitter at @aepstone or email her at Annie.Stone@harpercollins.com. Neither the Association of American Publishers (“AAP”) nor the Young To Publishing Group (“YPG”) represents nor endorses the accuracy or reliability of any advice, opinion, statement or other information displayed, uploaded or distributed through this website by any member, user, information provider or any other person or entity. Member-generated content published on this website reflects the views of the provider of the content, and does not constitute the opinion of the AAP, the Young To Publishing Group, or any of their respective members or divisions.